If we didn't have skin we would evaporate. Skin is not just a beauty showcase,but an important 22 square feet (2 square meters) defense shield for your body. When you walk you carry weight of 3.6 kilograms (8 pounds) with you. Yes, that is the weight of an adult's skin. Beauty is skin deep. What does the smooth surface hold in it? Skin anatomy dissected to show interior view. What does skin do for you? Skin protects the human body from environment. Skin is waterproof. No germs will enter because it secretes antimicrobial substances. Skin protects you from toxic chemicals. Skin protects you from getting fried with sun burns. Skin manufactures the vitamin D, which gives you strong bones. Most important is that skin INFORMS you of the slightest touch to painful stimulus. The nerve endings communicate straight with the brain. Skin is so sensitive that it acts like eyes for the blind. 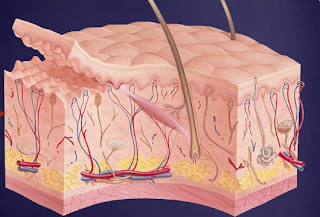 Skin is part of the feedback loop for regulating water and electrolyte balance. Skin, the largest organ of human body, is also an important player in romance, love, caressing, sensual touch and foreplay.